The Allard Pierson Museum of Amsterdam has reported that it has decided not to return the exhibits which were on display at the exhibition "Crimea: a golden island in the Black Sea" either to Ukraine or to Russia for the time being. “The Allard Pierson Museum will abide by a ruling by a qualified judge or arbitrator, or further agreement between parties,” the museum adds. Since the Netherlands does not recognize Crimea’s incorporation into the Russian Federation, which took place after the exhibition opened, the question now is to which country the collection should be returned to after the exhibition closes at the end of August. In late March the Ukrainian Foreign Ministry asked the Netherlands to guarantee the return of the Crimean exhibits to Ukraine. Recently Ukrainian Culture Minister Yevhen Nishchuk addressed the issue again. 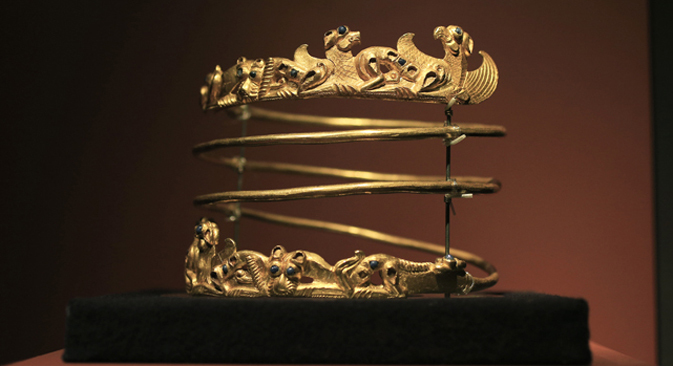 "We insist that all the Scythian gold be handed over for temporary storage to Kiev, the Historical and Arts Museums, depending on the exhibits, until the situation around Crimea has been clarified," he told a press conference in Kiev on August 21. Russia, meanwhile, has criticized the Dutch stance on the Scythian gold and insists that it should be returned to Crimea. “The decision by the Allard Pierson Museum to hand over the exhibits to the side in whose favor the court will adjudicate is clear. It is obvious that the Dutch are thus trying to avoid the role of an arbiter and protect themselves against any claims,” the Russian Foreign Ministry said in an official statement on its website on August 21. “However, it is difficult to acknowledge such a position as being substantiated from a legal point of view because contracts, civil legislation and international museum law require their return to those institutions where they have always been in storage." The claims made by the Ukrainian Ministry of Culture should not be an impediment to the contracts to conduct the exhibition and return exhibits to Crimean museums, the Russian ministry said. "Deciding otherwise will set a dangerous precedent for violation of the principle of the integrity of museum collections. We are convinced that museums must stay out of politics," the statement said.